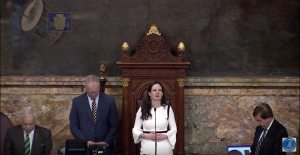 A prayer said on the House floor today by state Rep. Stephanie Borowicz (R-Clinton) is resulting in significant pushback from Democratic House members. Borowicz, a first term GOP representative and wife of a pastor, thanked Jesus and President Donald Trump in her prayer for his “unequivocal support” for Israel, on the same day the state House sworn Movita Johnson-Harrell (D-Philadelphia), into office, who became the first Muslim woman elected to the general assembly. “Lord, thank you that he stands beside Israel, unequivocally,” Borowicz said of Trump. Johnson-Harrell said in a statement to the Pennsylvania Capital-Star’s Stephen Caruso that the prayer from Borowicz was “highly offensive” and it “blatantly represented the islamophobia” that she believes still exists in some leaders. Some Democratic members vocally objected during the prayer, with Speaker Mike Turzai (R-Allegheny) appearing to hurry up Borowicz to finish speaking. House Minority Leader Frank Dermody denounced the prayer on the floor. She’s from Clinton Co. Do you expect anything different. Separation of church and state. Separation of church and state. Separate your god from my politics. Jesus, was that prayer the most passive-aggressive use of religion as a cudgel that I’ve heard in a long time! Jesus, was that offensive! Jesus, if he hadn’t stopped her, she’d have been speaking in tongues and whipping out serpents to handle. Jesus would have stopped her if he’d been present to hear her. Man I applaud the woman that was a beautiful prayer she know the word!!!!!! Get an education, Caleb. Backwater religious schooling does not count. She needs to write her prayers down before saying them. She repeated herself several times and appeared rambling. I thought at one point she was going to announce Jesus would be the keynote speaker at her next fundraiser and that he would join the Republican Party at her event. This really is an insult to religion and to public service. It is inappropriate and unkind to the Muslim legislator. I am a devout Catholic and I found this prayer both completely unnecessary and ultimately intolerant. Those who love gay ponies are attempting to undermine speech-freedom due to personal motivations; it wasn’t gay pony hating [neither by implication nor by inference] and, thus, the political motives of the pony haters should be targeted. Without the “slightly” altered authorship, this satire would be indistinguishable from an actual Sklaroff post. If you followed her campaign, this is no surprise. Since her election, she’s made clear she doesn’t want to hear from Democrats in her district. Rigid and inflexible. The prayer was meant to demean the religious beliefs of Rep. Johnson-Harrell. It was purposeful and offensive. A woman from a rural, conservative region of the state was chosen to deliver the words to send a clear message that Johnson-Harrell is not welcome in the PA House of Representatives. In a nation founded on religious freedom this intentional demonstration of religious bigotry is particularly offensive. The culture war is over, folks. The tolerant, modern, reasoning Americans will dance on the political graves of backward, bigoted, superstitious clingers. Even in the most shambling, can’t-keep-up sections of Pennsylvania. Those who attack this prayer are attempting to undermine speech-freedom due to personal motivations; it wasn’t Islamophobic [neither by implication nor by inference] and, thus, the political motives of the DEMS should be targeted. It was specifically and intentionally an anti-Muslim and Islamophobic attack on Movita Johnson-Harrel. But, it’s no surprise that you support it, with your long history of comments that essentially support Israeli genocide against their non-Jewish neighbors. Genocide. Really? One should use that word with caution. You are right about the hateful nature of that “prayer” but responding with irresponsible and false charges is also wrong. It’s difficult to read Sklaroff’s posts over the years and not come to the conclusion that he supports the complete genocide of the Palestinians. He tries to pretend that Palestinians are an existential threat to Israel (despite having no Navy, Air Force or atomic weapons, and Israel’s 25-to-1 kill ratio). Sklaroff had no problem with the hundreds of women, children and non-combatants killed in the Gaza War. He treated them all as combatants or supporters deserving death. He didn’t care about the indiscriminate bombings of civilians and civil targets (and housing) in a campaign of collective punishment (which is a war crime). Feel free to read his past ranting and judge for yourself. Then you did not articulate yourself clearly. If his position in your mind is the genocide of those who call themselves Palestinian, then that is deplorable. But that is not the policy of the government of Israel and I would think the vast majority of Israelis would find that perspective deplorable. But in the other hand, if many Palestinians could lob a nuclear bomb into Tel Aviv, they would. But why is Israel even a topic of political discussion anyway in the right and left? While it is not the “articulated” position of Israel, Netanyahu is clearly engaged in policy to drive them out of Palestine by making the place unlivable. I certainly believe that the right-wing elements in Israel would launch a nuclear bomb at Iran, if they could get away with. The majority of Israelis don’t support Netanyahu’s extremism, but because of how fractured their political system is and relies on coalitions, he’s able to stay in power. Netanyahu manufactured the flames that set off the Gaza War of 2014. There were three teenagers kidnapped and murdered. Netanyahu and the Israeli govt knew for weeks that the teens were dead, yet let a public “campaign” to find/rescue them. This was used as a pretext to round up and imprison hundreds of Palestinians for “questioning” and “leads”. That resulted in riots protesting the illegal arrests (and protesters were killed in the riots, further fanning the flames). Netanyahu continued to build false hope of finding the teens alive (when he knew full well they were already dead). So, after several weeks, when the teens bodies were eventually found, Netanyahu used the dashed hopes to gain support for his warmongering. The reason Israel is a topic of discussion is that in the US the right-wing GOP is very anti-Muslim and the Dems aren’t. So, the right-wing is trying to pretend that the Dems are anti-Jewish and anti-Israel. The mark of a racist demagogue is the capacity to spew-forth historical-revisionism, amplified by negative mind-reads; d2 is best ignored for, in prior posts, he has adamantly supported the “NAKBA” [namely, the fact that the re-establishment of the Jewish Homeland on 5/15/1948 was a “catastrophe”], a view that–except for the Muslimas newly-elected to Congress [and their pals, such as AOC]–remains a fringe-view in America. You are more full-of-sh*t than a truck of manure. I haven’t supported “NAKBA”, let alone “adamantly”. You, however, have cheered Netanyahu’s war crimes. Years ago, on this PoliticsPA site, I maneuvered you into admitting this; it’s instructive that you again engage in historical revisionism. I think BB is the greatest, and he reached his public pinnacles when he spoke to the UN and to the Joint Session of Congress regarding the evils of Iran. BTW, have you ever denounced these neo-Nazis? Naahhh. It was offensive. It was meant to be in your face. I’m a Jew and I was gobsmacked by its awfulness. I’ve heard plenty of public eting prayers — they’re never Jewsih prayers or Muslim or HIndu. They’re invariably either pretty Christian or mercifully non-denominational Deist, but this was a singularly disgusting display. My reaction was “Jeezus, there’s a lot of Jesus in there.” There wasn’t really any theme to the prayer except “How many times can I remeber to say “Jesus.” Even the Speaker finally nudged her to end it..
You are absolutely correct. She even stopped mid-sentence a couple times to work in another Jesus. Sounded like Ricky Bobby’s pre-meal blessing. If MJH is truly seeking to be “bipartisan” then she shouldn’t be so quickly when others express things from their point of view!!! 1. Apologizing for booing God at their convention. 2. Reprimand their leadership for their antisemitism. I won’t be holding my breath! And decent, educated, skilled, modern, tolerant Americans will be in the mood for pointers from disaffected, half-educated, economically irrelevant, superstitious, bigoted goobers . . . well, probably never. You will be replaced, Matthew. Watching Turzai is better than listening to her. The bigoted GOP on display. Nope. I don’t think that democrats should judge bigotedness. It is like a husky criticizing a chihuahua for being a dog. As Americans, we all get to pray as we see fit. Reminding us that most of Pennsylvania — and not just the Appalachian part — could easily fit in Alabama or West Virginia comes naturally to slack-jawed, superstitious right-wingers from our Commonwealth’s can’t-keep-up backwaters. I neglected to mention that she is a half-educated bigot. Please pardon the oversight. I have to disagree. She seems have a PhD in bigotry. Check out her facebook page. If I were present I would have told her to shut up and get on with governing or go back to your gun toting life and preach in your church because you apparently don’t understand “separation of church and state.” You have no right to preach your retoric in a government building. This country was founded to include religious freedom NOT your interpretation of god. Check out her facebook page. Nice seeing a representative toting a Glock down the front of her pants. How embarrassing! What kind of a prayer was that? She sounded like she was yelling at God. Not appropriate at all. Shame on her, she needs to do some learning before she tries to speak again. No. That wasn’t a prayer. It was a political statement cloaked as a prayer by an absolute phony. No self-respecting Christian would have done what she did. Shame on her and those who thumped their cowardly chests in approbation. My view exactly! Shame on her! I agree wholeheartedly Paul. Great prayer! WTG Bortowitz!! Speak the TRUTH and stand up for what’s right! Don’t be bullied by the DEMS in the state capital, ir ANYONE else, who would try to silence your faith. They’re the real bigots! So smug and comfortable in her religious bigotry and supremacy. Turzai and others need to take some action, maybe a reprimand, and she needs a lesson in civics. This is why James Madison did not want a legislative chaplain and Jefferson wanted a wall of separation between church and state. 1st amendment shuts you down ! The First Amendment creates a separation between church and state, protecting both from corruption by the other, and ensuring the free practice that has been essential to Pennsylvania since its founding in 1681. Many of us or our families came to Pennsylvania to escape persecution for our religious practice, and state favor of one sect over another is a danger to this freedom for all. Further, as a brother in Christ, do you truly think Rep. Borowicz is (or you are, for that matter) being a good ambassador for Christ’s love or do you think she is alienating people with a message politicizing the Gospel and perverting Christ’s Church with the vulgar politics of man? I encourage you to look inwardly and spend some time in thoughtful reflection and prayer, perhaps spend some more time with 1 Corinthians, particularly the 13th chapter, and with 2 Corinthians, particularly Paul’s words about persuasion and our call to the Ministry of Reconciliation. She believes she “did nothing wrong”; that’s what you call blind faith. Could not be mere coincidence that she gave that prayer on that day that the first Muslim is being sworn in.